HNLMS Friesland, the Dutch guard ship in the Caribbean, seized 1,600 kilograms of marihuana off the coast of Costa Rica during Operation Martillo, an international counterdrug operation. Earlier this week, a US maritime patrol aircraft detected 2 suspect-looking go-fast boats during a night patrol. HNLMS Friesland then approached the boats and, together with the patrol aircraft, gave chase when one of the go-fasts tried to escape. 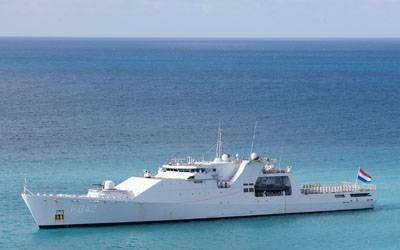 HNLMS Friesland in Caribbean waters. A boarding team of the Marine Corps was on stand-by in a fast boat, a so-called FRISC, while the suspect vessel tried to shake off the Friesland and its crew was throwing contraband overboard. The decision was then made to abort the pursuit and to collect the contraband in daylight. Using the Belgian shipboard helicopter, a total of 89 bales of marihuana, weighing almost 1,600 kilograms, were fished from the sea. The drugs were then handed over to the US Coast Guard for further investigation.